How can I check the RTU MBA Result??? 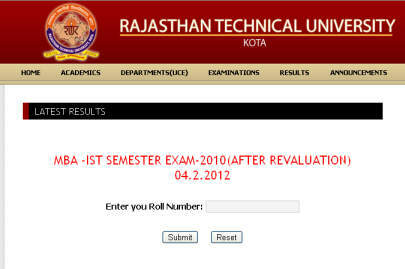 •	First of all visit the “MBA/BHMCT Results – Rajasthan Technical University, Kota” page. •	This is the result page you can get the result from this page by inserting your roll number in to the text box then click on the submit option. •	For your facility I am also uploading the image of the result. Question: In which area of specializations Eastern Institute for Integrated Learning in Management offer PGPM course? Question : Which programmes offered at the IILM College Delhi & also give me the contact details? The IILM is a private college in India. The IILM is located at central Delhi, India. Administrative Training Institute is the apex training institution of the Government of West Bengal. Administrative Training Institute has been providing quality training to officers of All India and State Civil Services, State Government departments and service cadres. Training program are carried for elected examples of Panchayat and Municipal bodies as well as for NGO functionaries. Question: Which courses offered at the Shirdi Sai Engineering College, & also give me the contact details of the college? Anjuman I Islam’s Allana Institute of Management Studies (AIAIMS) CST is a premiere institute, which is affiliated to the University of Mumbai. The educational corporation Anjuman-I-Islam was established in the year 1874. This institute provides the management based program. It is provide the placement with extra knowledge development & skills for there students. Question: Please provide me the Amity University MBA course structure? I want to take admission in PG so give me list of PG courses. Indian Institute of Finance was established in the year 1987 and it is approved by All India Council for Technical Education (AICTE). It offers following program. Question : Give me the list of the departments Netaji Subhas Institute of Technology Kolkata & also give me the contact details? The Netaji Subhas Institute of Technology (NSIT) established in 1983. The NSIT affiliated to the University of Delhi, Faculty of Technology. Give me recruited companies list of JAYPEE Business School Placements. Syscom Corporation & Smart Chip Ltd.